"Fantastic combination of everything delicious all stuffed into a bite-sized mushroom!" Preheat an oven to 350 degrees F (175 degrees C). Grease a 9x5 inch baking dish. Stir the cream cheese, Colby-Monterey Jack cheese, seafood seasoning, Cajun seasoning, hot pepper sauce, and garlic powder in a mixing bowl until smooth. Stir in the crabmeat and bread crumbs until evenly blended. Spoon the cheese mixture into the mushroom caps; set them filling-side-up into the prepared baking dish. Bake in the preheated oven for 7 minutes; set the oven to broil and broil until the tops are crisp and brown, about 3 minutes. These were ok. I used real crab instead of imitation. This makes about twice as much filling than 8 oz. of mushrooms can hold, filled generously, so I would recommend making half the filling. Simply delicious! I used real crab instead of imitation and it came out great! Used Monterey Jack cheese instead of Colby-Jack. Baked in oven for 10 minutes instead of 7 and broiled for 10 minutes on the middle rack. Watch very carefully. 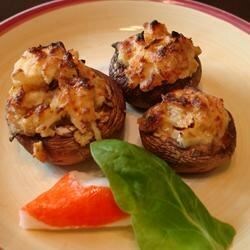 Nice change to the standard stuffed mushrooms! left out breadcrumbs, cajun seasoning.